We’d love your help. Let us know what’s wrong with this preview of A Place in Public by Marnie S. Anderson. 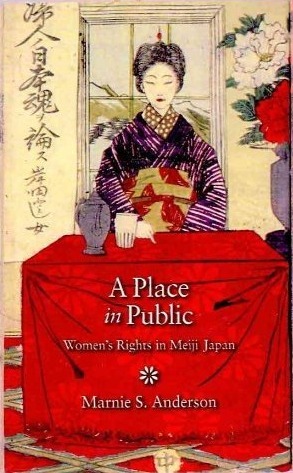 This book addresses how gender became a defining category in the political and social modernization of Japan. During the early decades of the Meiji period (1868-1912), the Japanese encountered an idea with great currency in the West: that the social position of women reflected a country's level of civilization. Although elites initiated dialogue out of concern for their co This book addresses how gender became a defining category in the political and social modernization of Japan. During the early decades of the Meiji period (1868-1912), the Japanese encountered an idea with great currency in the West: that the social position of women reflected a country's level of civilization. Although elites initiated dialogue out of concern for their country's reputation internationally, the conversation soon moved to a new public sphere where individuals engaged in a wide-ranging debate about women's roles and rights. To ask other readers questions about A Place in Public, please sign up.